Please note that the advice on this page reduces Outlook's security level and could leave you open to an exploit that takes over Outlook and sends mail on your behalf. We highly recommend you use up-to-date antivirus software that Outlook can detect and leave these settings alone. But, when all else fails... there is a way to disable the programmatic access warning in Outlook 2007 and up. Note that these settings apply to access to the Outlook Object Model, SimpleMAPI access to Outlook has its own registry key. How can I change the programmatic access options. They are greyed out and I cannot change them. I have an application that sends email out. I have to click on the allow/deny for each email. I want to be able to turn this off and on so I can avoid this message. These settings are only enabled if the current user is an administrator on the computer. Non-administrator users can see the current setting but will not be able to change it. Programmatic Access settings can also be controlled through Group Policy. Note: To change the Programmatic Access setting in Outlook's Trust Center, you need to run Outlook as an Administrator. You only need run as administrator one time, and once you make the change it will be in effect for all Outlook profiles on the computer. When Outlook is pinned to the desktop Taskbar, hold Ctrl+Shift and right click on the Taskbar icon. To use a Outlook.exe found using Windows Search, right click on the Outlook shortcut and choose Run as Administrator from the menu. 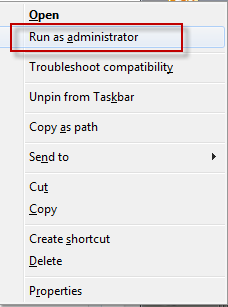 If you don't see Run as Administrator listed as an option, hold Ctrl+Shift as you right click on the Outlook shortcut. After Outlook loads, go to Tools, Trust Center (Outlook 2007) or File, Options, Trust Center (Outlook 2010 and up) and change the Programmatic Access setting. The next time you restart Outlook, start it in "normal" mode. If you prefer to edit the registry instead, you need to add the following key to the registry (create the key if it doesn't exist). You'll need to restart Outlook for the changes to take effect. You can also set the keys below. As always, if the keys don't exist in the registry, you'll need to create them. If you are using Outlook 2007, the keys are as follows. If you don't want to use Run as Administrator or Edit the registry, we have the following registry files you can download and run. These files set the values in both keys. Double click to run the registry file. After adding the keys to the registry, you'll need to restart Outlook for the changes to take effect. Note that you may need to right click and use Save as (or Save Link as in Firefox) - make sure the file extension is .reg. The section above applies to Object Model access, but it's also possible to send mail using Windows SimpleMAPI, which works with the default email client, which may not be Outlook. If you are sending email using SimpleMAPI, you need to set PromptSimpleMAPISend value to avoid the Allow/Deny dialog. If you don't want to edit the registry to add the PromptSimpleMAPISend value to the registry, use one of the prepared reg files to set the key. These tools will allow you to bypass the security settings. ClickYes Pro is a tuning tool for Microsoft Outlook security settings. It allows you to configure which applications can automatically send emails using Outlook and access email addresses stored in Outlook address book. ClickYes Pro runs as a background task providing a convenient icon in the taskbar notification area to manage allowed applications. It uses an encrypted storage and is highly secure and safe. Client and Server versions available. Works with Outlook 2000 - Outlook 2010. CodeTwo Outlook WarningDoctor removes the security warnings that appear when sending mail or performing other actions recognized by Microsoft as a "risky" (for example, when you try to read some data using the Outlook or CDO API #. Especially useful for designers of macros, Visual Basic, and programmers of other scripting languages that use the object model.Outlook 2000 and up, including Outlook 2010 64bit. Clicks the security dialog buttons automatically, but can be set to start in a suspended state. Developers can activate and suspend automatic clicking of the security dialogs programmatically. (HINT: Use &H2 instead of WM_CLOSE) Free. Language for programming Outlook/Exchange with C++ or Delphi only. Developers can use this to avoid the security prompts in Outlook. Outlook Redemption works around limitations imposed by the Outlook Security Patch plus provides a number of objects and functions to work with properties and functionality not exposed through the Outlook object model. Redemption supports Outlook 98, 2000, 2002, 2003, 2007, 2010, 2013, 2016 (both 32 and 64 bit) (Outlook 97 is not supported by the Safe*Item objects) as well as the standalone version of MAPI (no Outlook installed). Security Manager for Microsoft Outlook is a one-line programming tool that allows you to bypass security settings and avoid security warnings, alerts or prompts in add-ins and applications that interact with Microsoft Outlook. Security Manager is developed for .NET, VCL and ActiveX platforms (VB.NET, C#, C++, Visual Basic 6, Delphi, VBA, Word MailMerge) and supports MS Outlook 2000, Outlook 2002 (XP), Outlook 2003, Outlook 2007 and Outlook 2010 with / without service packs. Thanks a lot for share this info. I'm trying to run a fine piece of code from CPearson - modEnumValueNames, that uses VBIDE and MSFORMS to read a enum and from it create a function that return it's string "name". I did all MS MS and your's tricks and, unfortunately, isn't working with Outlook Office 365 (Office 16.0). Thanks for all the great info - having difficulty getting the correct reg key entries to make this work on Windows 10 64bit with Office 365 2016 32bit. Any help appreciated. Have tried the ClickYesPro app which works perfectly but would like to be able to do this via the registry. Have already tried turning off the programmatic warnings which hasn't helped. it *should* work as long as you use the 16.0 keys - but the June 2017 security update may have messed things up. Is the trust center option set to warn about all or only warn if there is no up-to-date antivirus software? Trust centre is set to never warn, manually changed this by running as administrator and then setting this value. I used the Reg file below and imported it. That guide worked for me until the arrive of the new "clickToRun" version of outlook. and the problem of the programmatic security message is back! i was able to make the change using run as administrator - this set the new key for ObjectModelGuard. I tried testing the old keys, but not triggering the warning dialog doesn't mean much - i don't normally see it anyway. Did you try setting the keys in policies? than i run outlook as administrator and the programmatic security was editable. The messages are still there! and the SECOND message of the programmatic security is gone, BUT i still have to click on the first message. Was the right place to edit! very gentle and professional , compliments! Are you using 32 or 64 bit Office? Which subscription do you have? Some policies don't work with the consumer and small business versions. When a policy key doesn't work, the keys may work in the office path (remove 'policies' from the key) but not all do. Thanks you so much, running outlook as Administrator was the best and simplest solution I found. I wish I could give you an Oscar for such an awesome post. I have an Outlook 2010 with Ex2013, set these reg keys through a GPO (checked, GPO works at the client), but still get the warning. Is there any caveats using Windows 2008 R2 remote desktop services? I have a user complaining, and none of the registry keys seem to work. Office version is 2010 Pro and the users are of cource standard users, not admins. The only issue is generally with cached mode. The reg keys *should* work but i would definitely add them as group policy (so all are under policies key). These keys are all available in the group policy office templates. Also, if nothing is selected in the greyed out section, delete the keys you added.